Kitten with a Whisk: M is for Mmmm or Meh??? M is for Mmmm or Meh??? The other night, BD and I went out for a somewhat special occasion. We've eaten at Mitchell's a couple of times before, but usually just at the bar for some drinks and appetizers. However, since this was a celebration of sorts we decided to eat in the actual restaurant. Looking back, we probably should have just went to the bar. It was the only lively spot in the place. There was a wonderful jazz pianist and probably more people in there than the dinning area. menu that did not have seafood at all. Granted we were in a "Fish Market" but I agree a little more variety would have been nice. 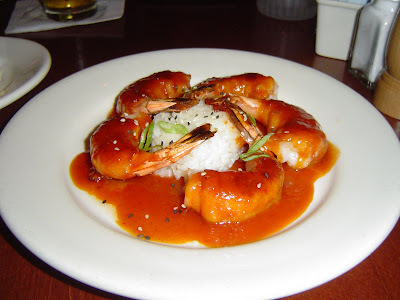 We settled on sharing the New Orleans Voodoo BBQ Shrimp. I think this dish was my favorite for the whole night. The shrimp were wrapped in bacon and then grilled. Very yum. The shrimp were much larger than I anticipated. They were cooked perfectly (nothing worse than overcooked shrimp... ok well maybe there is but its still pretty bad) and very tasty. The VooDoo BBQ sauce was tangy and sweet and had a little bit of kick in the aftertaste. BD thought it was too "tomato-y" but I didn't think so. The sticky rice was also well done and perfect for sopping up some of the remaining sauce. 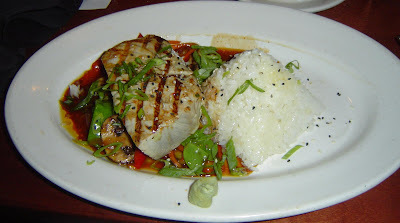 For the main course, BD ordered the Hoisen-Glazed Yellowfin Tuna with sticky rice and stir-fried vegetables. He loves stir-fried veggies but I can never get into them. You can't really see it here but the sticky rice is served like a little rice pyramid which kinda made me giggle. It was cute. BD really liked the veggies and the glaze but felt the Tuna was a little under seasoned. I agreed when he shared a bit with me. Also, he requested the Tuna pan-seared and they grilled it instead. It was cooked to temp though which is always a plus. I was really at a loss for what to order for dinner. I didn't feel like a full meal. So I decided on having a bowl of Lobster Bisque and then a Chesapeake Bay Crab Cake appetizer with a side of their scallion mashed potatoes. If there is one variety of food I am most picky about, it is certainly seafood. I grew up in New England, where seafood - especially shellfish - is taken very seriously. Furthermore, my grandfather was a Lobsterman for all of his life and that really had its advantages. I got spoiled with some of the freshest seafood imaginable. 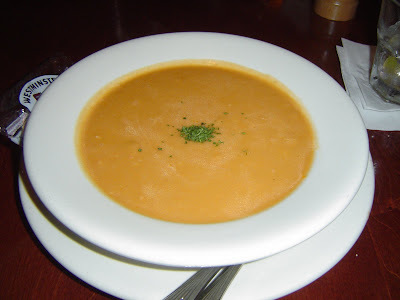 When I was debating on my order I was torn between the Lobster Bisque or the Soup Du Jour, which was Tomato Bisque with croutons and Goat Cheese. I should have went with Tomato. Lobster Bisque is very hard to get just right and this one was kinda a let down. The consistency was good and there was plenty of lobster but the flavor was a little too bitter and something was missing. Our server did time our food perfectly. Everything came out just a few minutes after we had just finished the previous course. The appetizer is actually served over a sweet corn saute but I swapped that for some taters. The crab cake is 95% lump crab meat per our server. I believe it, there was hardly anything else but crab in it. 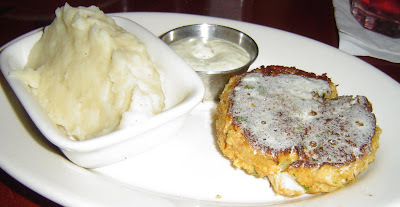 It was cooked just how a crab cake should be - with a nice crust on each side. I thought the melted butter on top was a great as well. It was still a little bubbly when it came to the table. The tarter sauce was also exceptional. I know that's hard to say about tarter sauce, but they "jazzed" it up a bit with a little bit of dill, and something else I couldn't put my finger on. The scallion mashed potatoes had a wonderful flavor. The scallion flavor was present but not overpowering. When I ordered them, I assumed there would be scallions in the potatoes but this was not the case. I believe they sauteed them in the butter or cream/milk and then strained them out. My only one complaint was the presentation. I know it was only an app, and a special order but a sprig of parsley or some confetti of some sort would have made it a little more attractive. While the dinner didn't wow, or overly impress me in anyway, I know we will be back. And next time we will probably eat in bar area. I have found that there are some restaurants where eating at or in the bar is better than eating in the dining room. Pizza and Beer fit for a Queen!